TOTALITY IS ONE AND SAMSARA AND NIRVANA ARE THE SAME. question In a qualified way, I concur with you that as time unfolds, in comparison with the past, things and events in the present seem better. But such comparisons, while uplifting, still must be set aside during the spirit's own work as it tries to recollect the fullness of its former self, having through desire, mixed unknowingly (avidya) with its phenomenal externalizations. Looking from within, we are still confronted by the enormous horizon of the not-self, having, I should add, fallen into the chemistry of dependent origination. In this wise, time also has to be viewed as the not-self, being akin to Samsara. In this consideration, we must still ascertain the pure self in the not-self, as Saint Asanga, in his Mahayana-sutralankara, points out. Adding to this, I would inject this idea and say, that while the spirit works over time, we should not think that the spirit is placed in time. Far from it. Fundamentally, the task of the spirit, in the bonds of Samsara, is to distinguish itself from time, thus dissolving its empathy with the temporal life, attaining subsequently Nirvana. By any measure, this is the task of Mahayana Buddhism which concerns itself with the transcendent Dharmadhatu, or the same, the 'deathless element' that the young Buddha-to-be quested for, leaving the gates of his beloved city. Finally, only those who have transcended this temporal world can be worthy guides of humanity, because only they are detached from the natural passions which cycle the species around its genus. This is another positive mark of Buddhist science which makes men unaffected by the contagions of desire, and thus makes for sounder governments, because humanity is ruled by such persons. answer We are sure that you will understand that the religious concepts of a human spirit and a transcendent Dharmadhatu are quite foreign to the Advayavada standpoint. Advayavada Buddhism is a non-dual and life-affirming philosophy and way of life. For the Advayavadin, Samsara and Nirvana are not different objectively. As professor Murti explains in The Central Philosophy of Buddhism, the primordial error consists in the intellect being infected by the inveterate tendency to view Reality as identity or difference, permanent or momentary, one or many etc. These views falsify reality. With the purification of the intellect, which is "the sole concern of Madhyamaka advayavada", prajña (intuition) emerges and the Real is known as it is, as Tathata (non-dual suchness). May we assume that you yourself are a Yogacharin? question Murti writes [on page 234] that 'negation itself is significant because there is an underlying reality - the subjacent ground. If there were no transcendent ground, how could any view be condemned as false. A view is false, because it falsifies the real, makes the thing appear other than what it is in itself. Falsity implies the real that is falsified. Phenomena are characterised as samvriti, because they cover the real nature of things.' Where Murti asserts that 'the real nature of things' is their 'transcendent ground', Nagarjuna writes in the MMK [XVIII.8]: 'Everything is real (tathyam), not real, both real and not real, and neither real nor not real'. answer In our view, the one does not preclude the other. All teachings, however profound, are but expressions of conventional truth (samvriti-satya), and what Nagarjuna gives us is therefore no more than one more conventional, albeit very insightful description of the nature of wondrous overall existence. question At least for me, the advaya standpoint only refers to the coordinate unity between Mind and its manifestations. When it is declared in the sutras that "every phenomenon is but a manifestation of Mind" I take this to mean that Mind and its phenomena are coordinate. As for your understanding that Samsara and Nirvana are not different objectively, they are nevertheless different essentially. This is implied in the sutras which say that they are the same "when viewed from the ultimate nature of the Dharmakaya". I must naturally assume that other than from this vantage point, both are not the same. Next, when Murti speaks about 'reality' it is in a transcendent, non-phenomenal sense that he employs the term. The Tathagata, for example, cannot be conceived through the senses nor through sensory ideas. I get no 'phenomenal reading' in his use of the term 'reality'. One last word, I am simply not convinced that Buddhism is anti-essentialistic. Without an essentialistic standpoint, terms like Buddha-nature become meaningless. In fact we might ask, how do beings become free from the cave of individuality except by seeing and knowing their Buddha-nature? answer The non-dual and life-affirming philosophy and way of life we call Advayavada Buddhism, to which we wholeheartedly adhere, is derived from Nagarjuna's Madhyamaka, or philosophy of the Middle Way. For the Advayavadin, Samsara and Nirvana are not different objectively, and there is, in Advayavada Buddhism, no talk of a mind separate from the body. Mind is merely to think and to think is a manifestation of being, as are to walk, to talk or to sleep. It is one of the many ways in which the one 'person' exists, i.e. becomes over time. To the Advayavadin, to say that the mind has or does things, sounds like saying that not one but one's running does the sprinting. This is particularly true when he or she hears other Buddhists saying, for example, that not they but their consciousnesses will eventually enter Nirvana or be reborn or something. However important, consciousness is merely to know, the activity of knowing going on in our brains. Mind (to think) and consciousness (to know) are not things but functions, activities, deeds, events without any substance or corporeality. Also Buddha-nature is insubstantial and not something different or separate from Reality - it is but a name for Reality as it manifests itself in sentient beings. Nirvana, for the Advayavadin, is indeed to live fully in accordance with one's Buddha-nature. The most fascinating concepts in Madhyamaka philosophy are, in our view, those of emptiness (shunyata) and the two truths, the conventional everyday relative or 'veiled' truth (samvriti-satya, cf. natura naturata, sub specie durationis) and ultimate truth (paramartha-satya, cf. natura naturans, sub specie aeternitatis). By conventional everyday truth is meant that all dharmas, i.e. things and events, or phenomena, which in fact have no self-nature or svabhava because they are produced and sustained by causes and conditions, seem to be as we perceive them with our senses only because of the idea we thus form of them or of their alleged opposite - in other words, all things are empty of inherent existence and solely the product of discriminating thought. By ultimate truth is meant our awareness of the underlying field of experience where all dharmas stripped of the superimposed relative aspects happen. Work and play are true only in the conventional sense, because they are experienced as such only because of our idea of them or their alleged opposite. The field of experience where the real event takes place is that of non-dual emptiness, shunyata, the realm of praj�a, non-dual intuition. That which is or occurs at any moment in time (there are at this level no actors, no-thing that does or acts, no me and mine) is no more than a herenow manifestation of being in the field of existence that encompasses the whole of totality, the so-called Dharmadhatu. Time-being, i.e. existence as a whole, the nature of which is advayata or dharmata or tathata or buddhata or suchness, or Buddha-nature in sentient beings, is spontaneously brought about by, and obtains its form and function from, the interdependent and conditioned co-arising or dependent origination (pratityasamutpada, as the term is understood in Madhyamaka philosophy), which is its immanent incessant dynamic principle. Buddha-nature, shunyata, advayata, dharmata or tathata etc, and pratityasamutpada are essentially identical - each term simply refers to a slightly different way of viewing the becoming of reality. Due to ignorance we may, however, misinterpret reality completely and see the conventional relative truth of for example work and play as ultimate truth. When we are unaware of or choose to disregard the existence of the underlying field of experience, when we are blind or oblivious to its wonders, we become enmeshed in Samsara or, to use more familiar Western imagery, we become the carriers of 'original sin'. But to experience existence at the level of absolute emptiness is nothing less than Nirvana - this is what the Advayavadin endeavours to achieve. The Dharmadhatu and its immanent incessant dynamic principle called pratityasamutpada are very much similar to the ideas of Tao and Te respectively; Tao is Totality and Te is how Totality really is or becomes. question What do you mean by Totality? answer What we mean by Totality is the infinite sum total of all finite existents, wondrous overall existence, Tao, Spinoza's substance (i.e. God, or i.o.w. Nature), natura naturans, the Dharmadhatu, i.e. the realm of all dharmas, where 'all phenomena arise, dwell and pass away'. question Your contention that "the absolute and phenomena" are "exactly the same thing" but "observed subjectively from a different perspective" is reminiscent of Japanese Tendai's hongaku thought, the chief characteristic of which is world-affirmation (genjitsu kotei). The major problematic of this doctrine, as you are aware, is that identity (advaya) amounts to the equivocation of phenomena with enlightenment - a quasi-pantheism. On the other hand, some Buddhists argue that identity takes place at the level of final enlightenment, sub specie aeternitatis. After a careful reading of your letters, I must assume that the so-called advayic identity of "absolute and phenomena" takes place at a phenomenal level for you, which I take is your position. By analogy, you are postulating that grasses and trees realize Buddhahood because of the identity (advaya) of subject and its environment. Yet it is easy to see that "grasses and trees" remain such as the environment remains such, neither losing its separate identity. How therefore is this identity, seems puzzling? In what way are even the grasses and trees identical? How is the sky identical with the trees and so on? I apologize if I am not making myself very clear. I enjoy our correspondence. We are like two old fools playing chess in the park! answer Your closing remark, which made us laugh very much over here, is very zenny and almost like a haiku. Two old fools playing chess in the park, indeed! We are very grateful for your pleasant and forthcoming attitude. We are also enjoying this correspondence very much. Tendai Buddhism, you might agree, risks becoming in the end, as a result of the exaggerated syncretistic zeal of its followers, no more than a well-meant ontological fantasy. The non-dual and life-affirming philosophy and way of life that we call Advayavada Buddhism is, on the other hand, purely an epistemological standpoint. In accordance with the doctrine of shunyata all distinctions are understood to be fundamentally illusory and artificial - dualisms as Nirvana and Samsara, or absolute and phenomena, are revealed as figments of our imagination. The term advaya in Advayavada means not-two in the sense of knowing that objectively there are not two realities nor two conditions or aspects of reality. When we say that Samsara and Nirvana are the same thing, we do not mean that they are identical in the sense of being two-but-the-same, as is meant by the Hindu term advaita, but that they are simply not two, that they are very literally one-and-the-same thing: rather simply put, Samsara is the name we give to reality as experienced conventionally and Nirvana is the name we give to the same one reality but as experienced by the fully enlightened mind - this identity is, indeed, also the third truth of basic Tendai philosophy. The tendency to view reality as two is a result of our fundamental ignorance of the true nature of reality, as professor Murti writes in The Central Philosophy of Buddhism. The Spinozean expression sub specie aeternitatis is frequently used by Buddhists to indicate that we would see for ourselves that there are not two realities if we were able to view existence from the completely non-conceptual standpoint of eternity. We can however ascertain rightnow, as indeed Madhyamaka proves, that there is no basis whatsoever to suppose that besides phenomena there is a second, transcendent and, moreover, superior reality. The specific purpose of Advayavada Buddhism, which literally means not-two-ism, is to actively propound the conclusions of Madhyamaka philosophy in this respect. Your grasses and trees are indeed two of the many different manifestations of vegetable life. Advayavada Buddhism does not maintain that they are identical phenomena; what Advayavada Buddhism maintains is that there is no reason at all to believe that there is a further second reality, invisible to the eye, parallel to these life forms or any other phenomena. In Advayavada Buddhism there are no other two than part and whole, numerator and denominator. There are not two realities, but there are, Madhyamaka teaches, two ways of seeing, of experiencing, of understanding the one reality: there are two truths, conventional everyday truth (samvriti-satya) and ultimate truth (paramartha-satya). In our everyday application of conventional truth, though we are aware of the intrinsic emptiness of all dharmas or phenomena since we know that all things are interdependently arisen and exist conceptually only by virtue of our idea of them or of their alleged opposite, we nevertheless do take into account and make use of the relative, conceptual aspects of phenomena in our commonplace interaction with other sentient beings and with our environment. As a matter of fact, the Noble Eightfold Path operates throughout exclusively at the level of conventional truth. As we advance along the Buddha's Middle Way responding to his promise of Nirvana by ridding ourselves of the so-called ten fetters (dasha-, dasasamyojana) that restrict us to Samsara, the fallacies in our perception of Samsara are progressively transformed, purified first into conventional truth, and it is through conventional truth that we shall eventually come to understand the non-conceptual import of ultimate truth. The dialectic of Madhyamaka, with its exhaustive analysis of the nature of reality, indeed takes place at the level of conventional truth. By ultimate truth is meant our awareness of the underlying field of experience where all phenomena stripped of their relative aspects are known to happen: it is our insight into the void beyond all concepts. This field of experience where the real events are known to take place is that of non-dual emptiness, advayata, shunyata, the realm of prajña, non-dual, contentless intuition. To experience existence at this level, which we can truly say lies between the notions of being and non-being, is nothing less than Nirvana. question What are those ten fetters you just mentioned? answer In Advayavada Buddhism, the ten samyojana or fetters that restrict us to samsaric life are: 1) belief in the self, 2) scepticism regarding the Path, 3) attachment to rituals, 4) partiality for certain things, 5) prejudice against certain things, 6) clinging to physical life, 7) hope of a hereafter, 8) conceit and pride, 9) intolerance and irritability, and 10) the last remnants of our ignorance. question Do I count three realms of experience in your description of the dvaya-satya doctrine: Samsara, conventional truth, and ultimate truth or Nirvana (more or less along the lines of the three kinds of knowledge in Spinoza: opinion, reason and intuition)? answer Though Nagarjuna's dvaya-satya teaching is very much a two-truths doctrine, as its Sanskrit name indicates, some aspects are comparable to Spinoza's teaching. Our application in Advayavada Buddhism of this essential Madhyamika doctrine is as follows: Samsara is to experience the phenomenal world at the level of conventional everyday truth (samvriti-satya). However, our initial perception of the phenomenal world normally contains many fallacies (mithyasamvriti-satya) and the conversion of these fallacies into true conventional truth (tathyasamvriti-satya), by following the Noble Eightfold Path, occurs entirely within the experiential realm of Samsara. At the same time the fetters that restrict us to Samsara are broken one by one. Ideally, our perception of Samsara becomes in the end wholly pure conventional truth, whilst all ten of the restraining fetters (dasha-samjoyana) have also been shattered along the way. Now, it is as a result of this thorough purification of our perception of the phenomenal world, at the level of conventional truth, that we shall then come to understand the significance of ultimate truth. Ultimate truth (paramartha-satya) is truth divested of all our preconceptions, including eventually those expressed here. Nirvana is to understand and experience the one phenomenal world at this level of ultimate truth - to experience the phenomenal world thus, brings about the complete extinction (nirodha) of all suffering (duhkha, dukkha) as a direct result of our full reconciliation with reality as it truly is. The fully liberated person has continually at his or her disposal, then, two truths: the everyday conventional truth of the phenomenal world and the ultimate truth of its pure, unblemished becoming, its Emptiness. question In what you say in your web pages there is a flavor of some sort of an underlying absolute reality. In some sense, of course, that must be true. As we investigate reality, we might imagine ourselves digging deeper and deeper into its fundamental reality. Absolute reality would be like the center of the earth - maybe it is beyond the capacity of human language to express, but there it is all the same. The contrasting view I prefer is more like probing out into space. The more we investigate, the vaster the universe appears. Eventually maybe we realize that space is boundless and that our investigations will be limited only by how far we push them. answer The results of that digging or probing, however sophisticated, still belong to conventional truth. They are only so many more conventional ontological facts, about phenomena, that one has been able to collect. They do not belong to an underlying reality nor do they have an underlying reality themselves. There is in Advayavada Buddhism no underlying reality, separate from phenomena, to be investigated. What we are after is ultimate truth. It is as a result of the purification of our perception of the phenomenal world, indeed at the level of conventional truth, that we shall come to understand the significance of ultimate truth. Nirvana is to experience the phenomenal world at this level of ultimate truth - to experience the phenomenal world thus, brings about the complete extinction of all suffering as a direct result of our full reconciliation with reality as it truly is. question Nagarjuna says something like this: "However confused people are who take ordinary appearances as substantially existent, even more confused are those who take emptiness as substantially existent." So how can we be after something that is not a thing at all? I think of absolute truth, of emptiness, as something like the inevitable ungraspability of things. And it isn't just ordinary things that are ungraspable. Also Buddhahood and emptiness are ultimately ungraspable. Emptiness simply already is, it's the nature of everything already, completely and thoroughly. But I nevertheless have the bad habit of grasping at things as if they were ultimately graspable, and I suffer and create suffering for others because of the incompatibility of my actions with the way things actually are. I need to bring myself into harmony with the nature of things, with their ungraspability, which is inseparable from their mutual interdependence. answer To realize what in Advayavada Buddhism we term 'to become a true part of the whole' one must follow the Eightfold Path. In Advayavada Buddhism the Path is interpreted dynamically as a fully autonomous process of progressive insight and, let us clarify further here, as strictly non-dual and non-comparative, this in the sense that it bears no reference at all to anything predetermined by others or oneself. A prescriptive method with preset demands and expectations is antithetical to all progress, both of the individual and the group to which he or she belongs. The Path is moreover not seen in Advayavada Buddhism as a means to become something in the future, but as the way to become as something rightaway in the herenow. It is seen as the way to become oneself herenow as existence interdependently becoming over time now in its manifest overall direction - it is by becoming herenow as the whole of existence as it is beyond our commonly limited and biased personal experience of it, that we free ourselves from suffering. Nirvana is when we experience our own existence as being completely in harmony with existence as a whole becoming over time, with natura naturans - Nirvana is, if you wish, the ultimate reconciliation with his or her Buddha-nature achievable by man. question We normally wander around sensing that phenomena are imbued with their own self-possessed selfness that marks them to be what they are, independent of anything else. We innately and intellectually perceive them to exist from their own side alone, self-established and intrinsically identifiable. They may be related or interact with other phenomena, but we generally see them to contain their own distinguishing identity. Doctrinally and experientially this is the selfness that is refuted in Buddhism. Emptiness (shunyata) is the non-affirming negation of such inherent selfness. Emptiness is a negation that only negates without affirming some other possibility. It is not someplace occupied by mystics and seers. It is not a state of mind where no thoughts echo. It is not something we can detect by staring at things hard enough. In no way is anything else asserted. Also emptiness is empty. Teachings and meditators hold that emptiness can be perceived directly, but nowhere do they assert that emptiness becomes a something. Emptiness is the absence of what seemed to be obviously manifest. answer Well said. The fully liberated person has two truths at his or her disposal: the conventional everyday relative or 'veiled' truth (samvriti-satya) of the phenomenal world and the ultimate truth (paramartha-satya) of its pure, unblemished becoming, its Emptiness. We say that it is as a result of the purification of our perception of the phenomenal world, at the level of conventional truth, that we shall come to understand the significance of ultimate truth. Nirvana is to experience the phenomenal world at this level of ultimate truth - to experience the phenomenal world thus, brings about the complete extinction (nirodha) of all suffering (duhkha, dukkha) as a direct result of our full reconciliation with reality as it truly is. Note, however, and always bear in mind, that man is the only being able to eventually view and experience reality under this aspect of eternity. In other words, Nirvana is a human concept. question My first reaction to your proposed revision of Buddhist phenomenology was to regard it as more Hegelian than Buddhist. Hegel of course shared with Buddha a non-dual, holistic concept of Reality. But Hegel's universe evolves. Through advancing human understanding, the universe is becoming conscious of itself. This notion of reality unfolding in history is quite alien to the Indic world-view that produced the Buddha. But this of course does not mean it is wrong, or that it is necessarily not a view held by Buddha or at least implied by his teaching. I also suspect that you are attempting to graft the Western idea of progress onto Buddhism. This would certainly be one way of resolving the difficulty of finding a satisfactory foundation for a Buddhist ethics in the West, but perhaps at the cost of blunting Buddhism's ability to provide a persuasive critique of the excesses of the Western faith in technology and progress. This again does not necessarily mean that you are wrong. answer We do not believe that the human regime, let alone any particular aspect of it, such as the advance of human understanding, is the measure of things in space and time, but that the whole of infinite existence is. 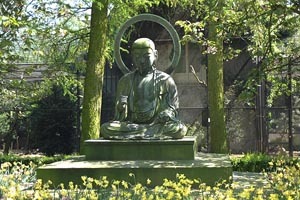 We are convinced that the objective of the Middle Way expounded by the Buddha as the correct existential attitude and way of life is the abandonment of all fixed views and to reconnect and reconcile us with wondrous overall existence and that the Middle Way in its dynamic Noble Eightfold Path form must consequently be seen as an ongoing reflexion at the level of our personal lives of wondrous overall existence becoming over time now in its manifest direction. In Advayavada Buddhism to follow the Eightfold Path is therefore not seen as a means to become something else in the future, but indeed as the way to become rightaway as wondrous overall existence becoming over time here and now. It is this process of being as existence now that we experience in human terms as progress and which makes us conclude, by induction if you will, that indifferent overall existence, also expressed purely in terms of human perception and experience, progresses as well. Nirvana is when we experience our own existence in the present moment as being completely in tune with existence as a whole becoming over time now. To experience our own existence thus causes the total extinction of all suffering as a direct result of our full reconciliation with reality as it truly is. question Reality (Buddha-nature, Nirvana) is according to Hsi Yun "nothing which can be apprehended. It is void, omnipresent, silent, pure; it is glorious and mysterious peacefulness, and that is all which can be said.. That which is before you is It in all its entirety and with nothing whatsoever lacking". Reality is simply what is, the totality. It cannot be subject to any change; it can get neither better or worse because it contains at every instant all that is and all that can be. Tao Sheng said that "the basis of Existence is unchanging, unruffled, like the surface of a pond". As Nagarjuna argued, "Nirvana is not a kind of being. It would then have decay and death". From the point of view of the Totality, there is "no origination, no annihilation". If we regard all phenomenal entities as capable of definition only through their relations as parts of a whole, then the whole itself is empty in the sense that "if entities [comprising the whole] are relative, they have no real existence. The [formula] 'this being, that appears' then loses all meaning". How then can the whole have a history? How can it be said to evolve? What would constitute its becoming better? Tao Sheng again: "The Real is what existed before this began to exist". On the other hand, what is the meaning of the Bodhisattva ideal if nothing is capable of getting better? If the Bodhisattvas seek the liberation of all things, await the liberation of all things, is there not implied an evolution of all things toward enlightenment? How can this evolution be something that is outside time and causation? How can it be other than a property of the whole? True, the liberating work occurs in the phenomenal world. But Nagarjuna also said "there is no difference at all between Nirvana and Samsara.. what makes the limit of Nirvana is also then the limit of Samsara.." Is not, then, the progressive enlightenment sought by the Bodhisattvas a perfection of the Totality? If all beings of the phenomenal world achieve enlightenment, does this not remove the last vestige of duality, the duality in our conception of the world that leads us to believe in the separate existence of things? Tao Sheng proclaimed that Existence is unchanging, but observed that "illumination, however, implies change.. error has ruffled the surface [of the pond of Reality] and we have lost mastery over our fate". If illumination implies change, and the goal of the Bodhisattva ideal is illumination of all things, is not Reality itself transformed when universal illumination is achieved? Is it not then, and only then, unruffled? I can resolve this through reason only by treating the Bodhisattva ideal as metaphor. Enlightenment is discovery of anatta, recognition that I have no separate existence from the whole, and thus that (1) I must have compassion for all things because they are me, and (2) that Liberation does not mean escape for the I because there is no I; it means simply recognition that I am part of the Totality. Thus it is only in a metaphorical sense that the Bodhisattva 'awaits' liberation of all things, and his/her work for liberation is merely a reflex of compassion, not a program that works itself out over time to some historical climax. But if this is so, does not the Mahayana collapse into the Hinayana once again? Is not liberation then something achieved only by the finite individual, which is itself illusion? This cannot be a satisfactory resolution. Or is this something that cannot be resolved by reason. Can reason take us only to the view that the real nature of things is unknowable? Nagarjuna seems to echo Kant: "[insoluble are the contrasting] views regarding what exists beyond Nirvana, regarding what the end of the world is, regarding its beginning". Buddhism rightly eschews metaphysics, but where does metaphysics begin? answer The following is a very attractive definition of Nirvana by the late Dutch Theravada monk Dhammapala: "Nibbana is not a state of being of an entity, but a moment of experiencing. In that moment there is no memory and no desire, no past and no future. And that moment cannot be remembered, cannot be called back, cannot be retained. Then, how could it be described? It is the moment when thought ceases, thought as conditioned by the past, by memory and tradition, thought as conditioned by the future, by anticipation and desire. In that moment there is no thought, no thinking which is reflection, but just the experiencing of being unconditioned, of being free, of not being. In that moment there is no recognition, no recording, no comparing. Thought has ceased: thoughts which claim 'I am', and thoughts which find security in the past, thoughts which seek continuity in the future, and thought which says 'I am now'." The term 'moment of experiencing' indicates clearly that also for the monk Dhammapala the realization of Nibbana is not a static but a dynamic condition. Possibly because of its simpliciy the writer's favourite definition of this same experience is that by Shree Rajneesh in his 1985 letter to him from Rajneeshpuram: "I talk about the truth as joy in the heart; it has nothing to do with logic, nothing to do with philosophy; it has something to do with a transformation of your innermost core, when your very being starts throbbing, pulsating, in tune with existence, when there is no discord between you and the whole, when you are so synchronized with the whole that you are no more but only the whole is." It is indeed this feeling of oneness with overall all-encompassing existence, of being a true part of the whole, that the Advayavadin seeks to achieve by following the Noble Eightfold Path. We are convinced that the objective of the Middle Way expounded by the Buddha as the correct existential attitude is the abandonment of all fixed views and to reconnect and reconcile us with wondrous overall existence and that the Middle Way in its Noble Eightfold Path form must be seen as an ongoing reflexion at the level of our personal lives of wondrous overall existence becoming over time now. Nirvana, as stated above, is when we experience our own existence in the present moment as being completely in tune with existence as a whole becoming over time now in its manifest direction - to experience our own existence thus causes the total extinction of all suffering as a direct result of our full reconciliation with reality as it truly is. Beyond this experience, however, nothing can be said.